Spark Arena is located on Mahuhu Crescent at the edge of the CBD. It is both accessible and highly visible from Beach Road and Quay Street and within easy reach of public transport, hotels, and restaurants. Please click the links below to view the carpark maps and transport options for Spark Arena. For the most up-to-date information on road conditions and closures that might effect your trip to and from the Arena, please visit the Auckland motorways closure page and the NZ Transport Agency homepage before you travel here. Also very useful is the AA Roadwatch website, with live data for motorways and local roads. Britomart station is a short 10-15 minute walk from the Arena and is on all major bus routes. Stairs and an entrance at the eastern end of the Britomart platform will bring you out onto a walkway that will take you to Britomart Place, which leads to Beach Road and Mahuhu Crescent. 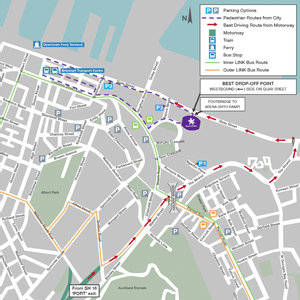 Alternatively the Beach Road stop on the Inner Link Bus Route is approximately 100m from the Arena. The Link Bus runs continuously 7-days a week. Britomart Station is handy for the venue; just a short 10-15 minute walk along Customs Street East or Britomart Place and Beach Road. Late rail services often run for our larger events; please check with Auckland Transports' Events page nearer the date. The Downtown ferry terminal is a 10-15 minute walk away, either along the waterfront route via Quay Street, or the more sheltered route along Customs Street East and Beach Road. Visit Fullers ( 09 367 9111) for more information about getting there, including timetables, fares and maps. SkyBus provides a convenient 24/7 bus service between Auckland Airport and Auckland CBD. The service terminates at Customs Street, next to Britomart, a short 15min walk from the arena. City to Airport transfers take approximately 40-60 min. Times can vary depending on traffic conditions. Please allow 1 hour travel time. Please see the SkyBus website for a timetable of departures, as well as pricing details. Spark Arena has no public parking on site, and we encourage the use of public transport! However, for those who choose to drive, there are approximately 7,000 carparks within a 1.2km radius. The independent website Parkopedia also has a map of parking that you might find useful (click here). WE DON'T WANT YOU TO GET TOWED!!! Restrictions on the streets near the arena vary depending on the size of crowd we are expecting, so if you are thinking of parking on the street as opposed to in a parking building, please check signage to avoid getting towed. We have a limited number of nearby carparks designated specifically for mobility pass holder parking. However, these spaces must be pre-booked, and they fill up quickly. A space can be reserved once you have your event ticket; please contact us directly via email or via phone, on (09) 358-1250, well before the event. Please include the registration number of your vehicle and a contact mobile number when you enquire. For more information on mobility parking as well as how we can cater to special needs, please visit our Special Assistance page. Make travel to the event hassle free with the Uber smartphone app, we've teamed up with Uber to offer a free first ride (up to $20) to new Uber users! 1. Download the Uber app on an iPhone, Android or Windows device, and create an account. 2. Tap the menu button in the top left corner of your Uber app. 3. Tap the Payment option. 4. Scroll down and tap the Add Promo/Gift Code option. 5. Enter your promo/gift code which is "SPARKARENA"
6. Check the ETA, 'REQUEST' when you need a car, and enjoy the ride! Visit the Uber website for more information on using the app. Coming from State Highway 1 from the South, take the 16 East "Port" exit 429B-C (If coming from the North, it's Exit 426-B). Follow it to the bottom of Grafton Gully and from there continue straight on under the railway bridge, along The Strand until it terminates at the intersection with Quay Street/Tamaki Drive. Turn left onto Quay Street and travel to the drop-off point which is approximately 500 metres along at the base of our footbridge/ramp (You'll see the McDonalds/Mobil complex shortly before it, and then the big Spark Arena banners on your left). If you're coming from the central city, you will travel past the Arena on your right and then you'll need to turn right into the shops at the McDonalds/Mobil complex in order to turn around and approach the dropoff from the right direction on Quay Street (Try not to miss this turning point as there is no right turn all the way down onto Tamaki Drive). Coming from State Highway 1 from the South, take the 16 East "Port" exit (429B-C). (If coming from the North, it's Exit 426-B). Follow it to the bottom of Grafton Gully and from there continue straight on under the railway bridge, along The Strand until it terminates at the intersection with Quay Street/Tamaki Drive. Turn left onto Quay St. and travel to the drop-off point which is approximately 500 metres along at the base of our footbridge/ramp (You'll see the McDonalds/Mobil complex shortly before it, and then the big Spark Arena banners on your left). Entrances to car park buildings in Tapora St., Tangihua St., and Britomart are found a little further along Quay Street as you continue west. If you're driving to the show, a quick check of the Auckland motorways closure page and the NZ Transport Agency's Auckland info page should alert you to any anticipated travel delays so you can plan your trip accordingly. Also very useful is the AA Roadwatch website, with live data for motorways and local roads. There are a number of ways to get to Spark Arena by road - click on the map to enlarge it and see our suggested driving directions.